that you can print out. Miss with Attitude aka "Poco" with her old trainer and her new family. Follow Miss with Attitude's Success Stories. Buying a Prospect Horse is like eating potato chips. You cannot stop at one. 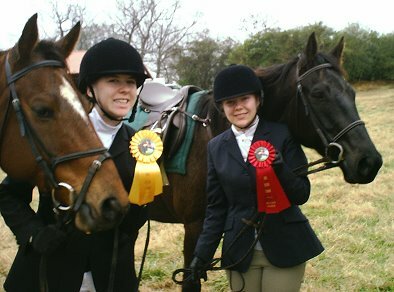 . .
Laura Durham-Dixon has now purchased two more prospect horses: "Josh" and Noshrinking Violet. Still not comfortable with the process? Read a few of our Prospect Horse Success Stories to learn more. 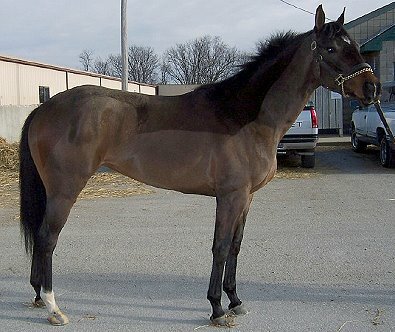 Wiseguy's Out's owner Jennifer Dunlap, DVM has also purchased two prospect horses this past year in addition to Wiseguy's Out who was purchased from our Horses for Sale page. February Prospect One - SOLD! 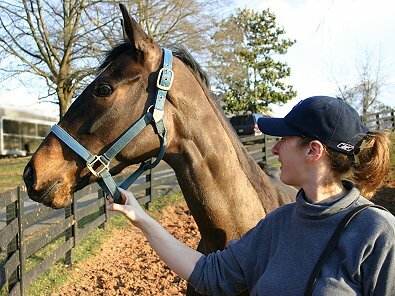 Miss with Attitude aka "POCO" is lead off the trailer by her former race trainer upon arriving at Bits & Bytes Farm. Miss with Attitude aka "POCO" stretches her legs after a long ride from Kentucky. Miss with Attitude aka "POCO" quickly settled down to enjoy the green grass at Bits & Bytes Farm in Canton, Georgia. You found a horse on the Prospect Horses page. What now? Call ASAP. 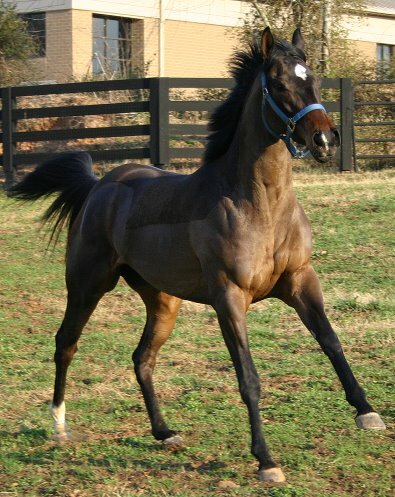 Sometimes these Prospect Horses go quickly because they are priced for a quick sale by the owner/trainer. 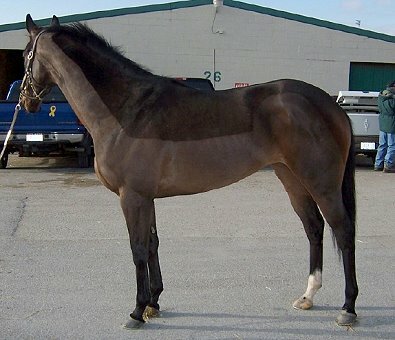 We will tell you what we know about the horse and put you in touch with the seller. We will also help you to arrange for vetting and shipping. It is usually not possible to visit the horse at the track. If you are not comfortable buying a horse without seeing it, then you will not want to pursue getting a Prospect Horse for Sale. 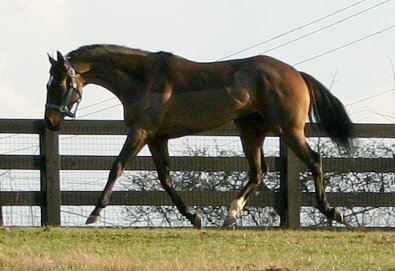 Miss with Attitude stretching her legs upon arriving at Bits & Bytes Farm from the racetrack in Kentucky. "I've never bought a horse from a photo before!" - a true quote from a buyer of one of our prospect horses. Let's walk through a real live example of a Prospect Horse Purchase. We'll use our 2005 February Prospect One as an example. We will take you through the process and explain how to get the best deals on Thoroughbreds. Here is the original information from the Prospect Horses Page. Miss with Attitude and at the race track in Kentucky. This filly is just four years old and 15'1 but still growing. She has a heavier quarter horse build. She loves to be ridden, has a great personality. Her trainer says she is very friendly, should go right into whatever you want her to do. She is sound. This horse is a character and well loved by the trainer. This miss is a Danzig granddaughter. We recently sold Wiseguy's Out to Dr. Jennifer Dunlap of Memphis, TN. He is also Danzig grandson. The event riders like this breeding and I had them fighting over Wiseguy's Out. Both horses have the same sire: Outflanker. She looks like she has the same build as Wiseguy's Out. Wiseguy's Out is showing great promise in his jumping and dressage with his new mom and aunt and we expect he will do well as an event horse and fox hunter. You might remember Elizabeth fox hunted Wiseguy's Out at the opening meet for Shakerag Hounds in October. He was just about a month off-the track at that time. Wiseguy's Out has the same sire as our February Prospect One. They have a similar build. She is very well bred with Alydar, Raise a Native (top and bottom), Native Dancer, Mr. Prospector, Northern Dancer, Buckpasser, Tom Fool, Runaway Groom, Nearctic and many other top horses in her pedigree. If you like her, she can be vet checked at the track. X-rays are just $10 per x-ray at this track. 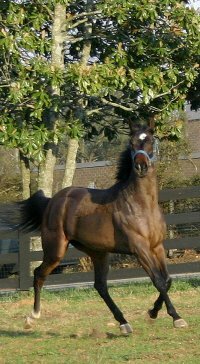 Many more buyers are taking advantage of our direct from the track best price option for getting an off-the-track Thoroughbred. We will assist you through every step of the purchase process including getting the horse to your farm. Miss With Attitude has been SOLD! The prospective buyer of 2005 February Prospect One contacted us. We shared what information we had about the horse and found out what experience level the prospective buyer had. We will not sell a horse directly from the track to children or inexperienced riders. We may waive that rule if there is an adult trainer involved. We want the horse to get the best possible training so that it will go on to a successful second career. Miss with Attitude looks over Bits & Bytes Farm. After speaking with the prospective buyer, we determined that it was a possible match. Step Two - Deposit the cost of the horse in the Bits & Bytes Farm bank account. The prospective buyer deposits the full cost of the horse into the Bits & Bytes Farm bank account. We fax back a confirmation letter stating that the money is 100% refundable until the Bill of Sale is signed by the buyer and faxed to Bits & Bytes Farm. The buyer is then given the trainer's contact information and the registered name of the horse so that the pedigree and race records can be checked. Should the buyer not like what the trainer has to say about the horse or if the horse does not vet out, 100% of the deposit is returned to the buyer. 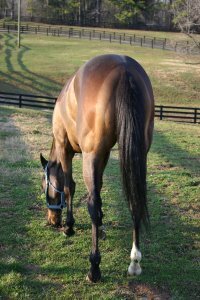 Look at our FAQ page to get an idea of Prospect Horses' pricing. We have learned by experience that when the money is deposited the trainers know we have a serious buyer and they are willing to speak with the buyers. They do not have time to talk with everyone who is interested in their horse. That is why they have hired us to act as their broker. The owner/trainer sets the horse's price and we add a fee for our service. Please do not haggle with the seller on the price. 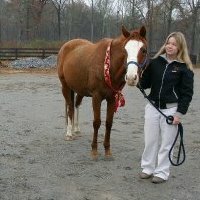 We want the owner/trainer to call us again when they have a horse that needs a new career. If we beat them up on price for your horse, we won't get any more horses from them. When the money is held in escrow by Bits & Bytes Farm, the owner/trainer knows we have a serious buyer and everything moves smoothly. Vet checks happen fast and the horse might be shipped out the next day so money in the bank keeps the process quick. These trainers are needing stalls and we cannot wait days or weeks to finish the transaction. The prospective buyer should speak with the owner/trainer and ask detailed information on training, temperament and soundness of the horse. The prospective buyer will then let us know that a vet check is requested or that they want their money returned. We don't want your money if you don't want the horse. A horse may be still racing but have soreness from racing or even an injury that might be unknown to the trainer, so a vet check is always recommended and required. Either the owner, trainer or Bits & Bytes Farm will supply the name(s) and number(s) of vet(s) who are at the track or farm and can do the vet check. The buyer my choose to find a vet on their own. The buyer should vet the horse out to a level that makes them feel comfortable about buying the horse. The vet check may consist of only flexing and checking the eyes and heart or it can be a full fledged vet check with x-rays or ultra-sounds. These x-rays can be sent to your local vet if you choose and if time allows. If this is something you wish done, you should order digital x-rays to save time. Miss with Attitude is looked over by her new mom and "Friend of Bits & Bytes Farm", Paula. Always keep in mind that the horse has raced and there may be some changes in the x-rays and these should be discussed with the vet to determine if the horse will hold up for your discipline. Seldom does any horse ever have perfect x-rays or absolutely everything perfect -- even if the horse has never raced. Be realistic about what you want to do with the horse and discuss that with the vet. Don't say the horse has to be able to be an advanced event horse if you have never even competed before. You might end up missing out on a horse that would take you through to training level and that's more than you really have the desire to do. Expect a vet check to start at about $50 and go up depending on the number of x-rays you take. 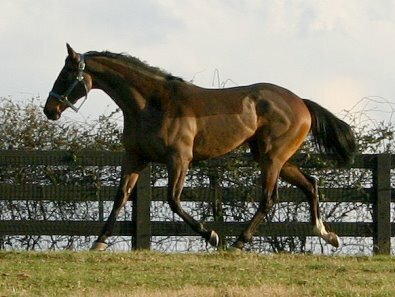 Many horses with old injuries such as osseletts and bowed tendons still are suitable for careers with low level jumping or at the very least dressage or trail riding. These horses are very reasonably priced and sometimes even FREE! 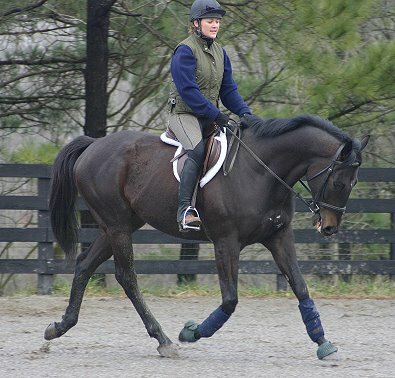 Our 2005 February Prospect Horse One was vetted out to the prospective buyer's satisfaction and horse's second career path as an eventor, so all that was left was to get her to the buyer. 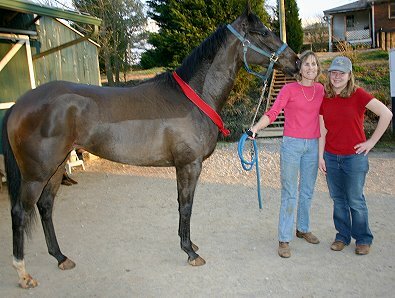 You are welcome to go pick up the horse yourself or Bits & Byes Farm will help you arrange for shipping of your horse. We have shipped horses to California to Maine and states inbetween. We have even shipped a horse to Mexico. Miss with Attitude has lovely movement and should be suitable for an eventing career. Once again Bits & Bytes Farm is there to assist. Sometimes we are going to the track on a buying trip and can pick up your horse when we are there. Sometimes the trainer will be bringing horses to our farm and your horse can share a ride and you can pick it up at our farm. Bits & Bytes Farm can also recommend professional haulers that we know and trust who will deliver your horse door-to-door from the track to your farm. Ballpark shipping at a dollar per mile. With gas prices constantly on the rise, this number could vary. The cost can vary depending on location of the horse and your farm and if the hauler has other horses going your way. Miss with Attitude ak a"POCO" enjoying the pasture at Bits & Bytes Farm. 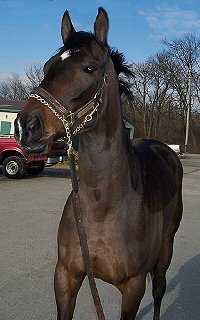 We arranged for the trainer of 2005 February Prospect Horse One to deliver the horse to Bits & Bytes Farm as we were having another horse brought to us from the track as well. The prospective buyer was waiting at Bits & Bytes Farm when the horse was delivered. After a "look over" we turned the horse out into the pasture to see how she moved. She was lovely. 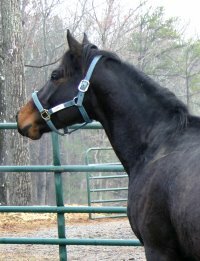 She was soon loaded onto another trailer for the short ride home to Griffin, Georgia and the start of a new life away from the racetrack. Congratulations to Laura Durham-Dixon on the purchase of 2005 February Prospect Horse One - Miss with Attitude aka "Poco". Hi Elizabeth, Thank you for your hospitality yesterday and for knowing Becky and finding Poco! We made it to Griffin without any problems-thankfully the thunderstorm held off till later. I took her to my trainer's barn for at least the first couple of days. We don't live at our land yet, and I have to work, so I will take her over to the land later this week when I can be out there and make sure she settles in alright. Our other horses out there are pretty easygoing, but you know how they have to get all excited when somebody new comes in. She made friends with my Oldenburg (that you met at Imti/Gigi last year) at Lisa's barn last night. I really enjoyed meeting Becky and seeing Linda again. Thanks again, and I'll keep you posted on how we're doing! Go to Miss with Attitude's Success Stories page. 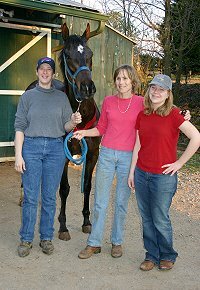 Laura has purchased several more horses since 2005. Her latest horse is Coin Maker.